Just because a dish is delicious doesn’t mean your kitchen will smell really great, too. Chances are, some of these wonderful dishes will leave foul lingering cooking odors around your kitchen and worst, your entire house. Below are a few tips to neutralize those unpleasant food odors. Make sure to wipe your kitchen surfaces clean, especially after frying. Use a rag or sponge, which has been dipped in degreasing dish detergent, to clean up your kitchen. For extra deodorizing power spray all hard surfaces with ODOREZE™ Natural Home Odor Eliminator. Rinse with a damp towel afterwards. The simplest way to ventilate your home is to open the windows. Air out those unpleasant odors. An exhaust fan along with ceiling fans can help too. A simmering potpourri with citrus peels, cloves, spices, nutmeg, and cinnamon can also help freshen the air. 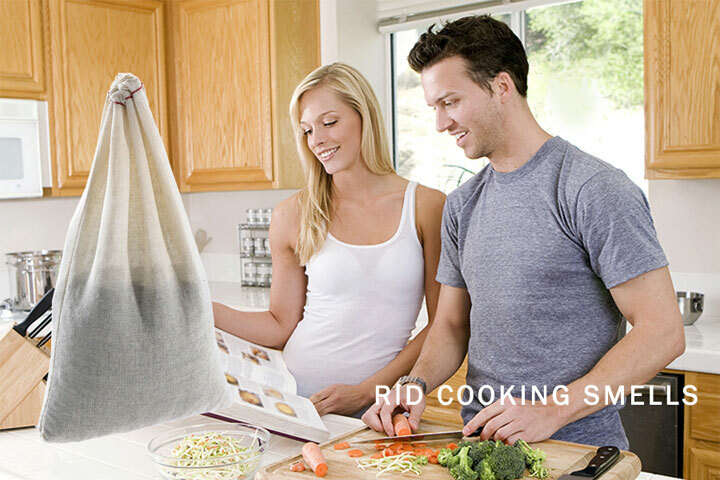 To prevent cooking stench from lingering after preparing your favorite meals, keep a SMELLEZE™ Reusable Cooking Smell Remover Pouch in your kitchen. It will stop the food odors without using any hazardous chemicals. It also works for years so it’s very cost effective and will save you money. The same product will, of course, also help you get rid of any existing food smells. Andrew Wise writes for Dietdecide.com, which lists South Beach Diet reviews and tell you if it’s a good fit for you. My new tenant cooks currys every day.All the house smells and other tenants are complaining HELP!!! I would recommend using Smelleze® Reusable Cooking Smell Deodorizer Pouches to eliminate unpleasant airborne food odor.